We all know how hard it is to cope with a new baby let alone think about loosing weight. After the baby is born there a few things that you can do that can slowly help shed the baby weight and one of the well known secrets is “breastfeeding” Here are a few tips that might help get you started. Reduce your risk of diabetes, heart disease, high blood pressure, cancer, and stroke. 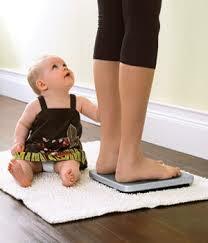 Tip 2 – Wait six weeks after your baby’s birth to actively start weight loss. Your body needs time to rebuild after giving birth. Remember that each body is different so do not pressure yourself into fitting into those size 4 jeans. Tip 3 – To lose weight, eat smart. Choose foods from the Food Guide Pyramid. Select lower fat, high fiber foods and watch portion sizes. Eat regular meals; don’t skip meals. Try to eat at least five fruits and vegetables each day. Tip 4 – Lose weight slowly, about one to two pounds a week. Combine smart eating with physical activity. Tip 5 – Be physically active for 30 minutes most days, if not every day. Find activities you can enjoy. Pick activities that fit your lifestyle. Bottom line: To reach and stay at a healthy weight, eat smart and be physically active.